Caution. Full disclosure, foodie guidance strongly advised. Wait. First, would a foodist be one who is a lover of food or adverse to food? Unrelated, but depending on the answer, will become relevant later. Ok, so here’s what. I have recently, inside of the past 2 years, undergone a food makeover. True to science, my taste buds really did change! Part of my repertoire now, which never were before are tomatoes (woohoo! Heirlooms are back in season! Just had an amazing ‘green zebra’ salad tonight), olives, mushrooms (now nearly synonymous with meat, and how I ever lived without them I’ll never know), all kinds of fish (sardines, especially), an really anything else that ever had a bad wrap–sauerkraut, beets, pickles, etc. I think the only thing left that I haven’t gotten used to yet is okra. I just can’t seem to get those little hairy suckers down. Ew. Anyway, just like I may have jumped the gun a little too quickly on some delicious foods, I MAY have jumped the gun on some restaurants too. Keyword here: MAY. I love a good boycott and I love a good fight. Reasons for these have included, poor service, unsanitary conditions, repeated bad food (nothing worse than an unfulfilling meal, i.e wasted calories), or bad energy (yes, I require smiling faces of the people who interact wit my food! Energy transfer is real, people!). Enter Liquid Earth. It’s on Aliceanna Street in downtown Baltimore. It’s one of maybe 3 all vegan spots in the city, with a great raw menu to boot! Delicious. Caring. Worth the money and the drive. I say all this with my tail between my legs of course! Liquid Earth was on my boycott list for just long enough for me to question..”why am I not eating there, again?” I never did think of the answer until a friend reminded me, “it was too hippie”. POOR. Shame! And I’m sorry. But just like my food tastes matured, so have my expectations of a restaurant! I didn’t value the earthy, grounded, whole ingredients, slow food nature of a place back then, like I do now! 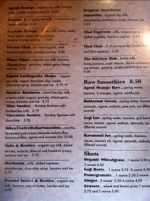 I mean for instance, look at the creativity of this menu! Bee pollen! Who uses bee pollen! Amazing. Anyway, I am reviewing my boycott list, and checking it twice. I need some quality control here! In the meantime, I have some lost time to make up for with my new friends at Liquid Earth. So on Day 1 post Raw Diet, I ate a 100% raw breakfast, a 80% raw lunch, and 0% raw dinner. For lunch, along with the leftovers of my awesome bloomed wild rice, I had some Mary’s Gone crackers. I was excited, pumped even, to have my first non-raw food in 15 days. Ate one cracker. Ate two. They tasted burnt, I thought. Kept eating them. They tasted…plain. Then, by the time I finished them, they were okay. But I LOVE Mary’s Gone, I thought. Still, about mid way through, I stopped eating them along with the bloomed wild rice because I felt like they were ruining it. For dinner I went out to a local restaurant, One World Cafe, and I had the same chili I’d craved time and time again over the years, “chock full of organic brown rice, vegetables and beans” the description reads. Took one bite. The vegetables were limp. Took another. The rice had disappeared into the stew. And where was the spice? All I could think about was the delicious raw chili I made a week ago, and the sprouted quinoa I had along with it. So, what’s changed? Everything!! My soul and my taste buds has gotten so used to the textures, colors, bursting flavors, crispness, and freshness of raw food, that it’s incredibly underwhelming to eat cooked foods so far. I’m sure it’s a “getting used to” process. I’m certain in no time at all I will discover the yum factor again. But I hesitate in saying that too quickly, as I think…should I find the yum factor in cooked foods again? Should I listen to what my body is telling me, and continue my Raw foods journey. Maybe we’ll compromise. We, as in me and my body. I will continue reintroducing my cooked food favorites and go-to’s. But maybe Raw should be the foundation of any meal I have. For instance, with the chili tonight–if I were making it, maybe I add cooked beans and brown rice, but use raw veggies and a raw stew. How could 28 years of cooked foods all of a sudden feel so foreign? I wasn’t expecting this to be one of the outcomes of my innocent little experiment. I was really expecting to be swimming through mounds of sweet potatoes and blowing bubbles in bisque by now. But all I really want is the raw oatmeal I have soaking in the fridge for breakfast tomorrow. Curious, eh? But here I am…imagine my surprise! Wait…There are Politics Involved in Raw Diets? Day 4. I thought it was going to be all kumbaya. I thought we’d all eat of the same fruit, share the same Manna, and sprout the same seed. Again…Imagine my surprise! when in fact, there are categories of raw, each filled with it’s own distinctions, classifications and (GASP!) commitment levels. As if it’s not enough to agree to oneself that this is the lifestyle he/she wants to lead…you have to be judged by your commitment level at the same time? True. So, I learned that there are percentages that classify how raw a person is. Many claim 80%. Meaning the remaining 20 is filled with some other unholiness (I’m already dreaming of what my 40% will be–raosted sweet potatoes and cauliflower, wild mushrooms in a delicate broth). There are also vegan-raw foodists, vegetarian-raw foodists, and then there’s the…wait for it…raw foodists. I sort of love being any kind of “foodists”, but really? I feel like I need letters after my name, or like one of those bracelets diabetics wear. I guess the classifications help on some level. Wait! I’m a pesqu…raw-foodist (that word again). This diet is forcing me to behave so pretentiously! In light of my questionable classification, I was nervous about showing myself in a public restaurant, but had plans to go out for lunch. (Shockingly) What an amazing experience I had! The Black Olive, in Baltimore. I had the fortune of being able to speak with the Chef, who was totally hip to my foodist request that everything be prepared raw. He responded with letting me know they had just received a wild salmon delivery, and would I like for him to sashimi some on top of my avocado Greek salad. Would I??!!! So in the midst of my newly found politically driven, foodist pretentions, I had the best lunch I’ve had in quite some time!